A tie usually isn’t something worth celebrating, but considering the Browns went 0-16 last season, a tie almost felt like a win on Sunday. 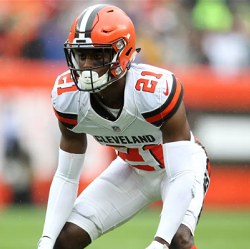 The Browns had to launch a fourth-quarter comeback to force overtime, and they finally avoided a loss against a rival that has dominated them in recent memory. Ward and the Cleveland defense shined, forcing six turnovers and keeping the Steelers scoreless in the fourth quarter and overtime. Saivion Smith, CB, Alabama (NCAA) — The defending national champions are up to their old tricks, having scored two defensive touchdowns in their first two games while (again) looking every bit like the best team in the country. Smith, a junior, had a 38-yard pick-six in Alabama’s 57-7 rout of Arkansas State on Saturday. Harrison Smith, FS, Vikings (NFL) — Eight tackles, one sack, one interception and one fumble recovery in Minnesota’s season-opening victory over the San Francisco 49ers. The fumble recovery ended a Niners drive at the goal line, and the interception sealed the Vikings’ 24-16 victory. K’Von Wallace, S, Clemson (NCAA) — In one of the marquee college football games of the week, No. 2 Clemson was clinging to an eight-point lead over Texas A&M on the road with two minutes left and the Aggies driving. A&M’s Quartney Davis was headed in for a touchdown when Wallace knocked the ball loose and forced Davis to fumble out of the end zone and give Clemson the ball on a touchback. The Aggies got the ball again and scored a touchdown with 46 seconds to go. They needed a two-point conversion to tie, but Wallace picked off QB Kellen Mond’s pass to ice the Tigers’ 28-26 victory. Clayton Fejedelem, SS, Bengals (NFL) — After starting strong safety Shawn Williams was ejected in the first half of Cincinnati’s opener against the Indianapolis Colts due to a helmet-to-helmet hit on QB Andrew Luck, backup Fejedelem entered and had the best game of his pro career. Along with making 10 tackles, he forced and recovered a fumble in the final minute and took it 83 yards for a touchdown that put an exclamation point on the Bengals’ 34-23 victory. Jalen Elliott, S, Notre Dame (NCAA) — His two interceptions set up a pair of touchdowns in the Irish’s 24-16 win over Ball State on Saturday. Elliott, a junior, also had seven tackles. 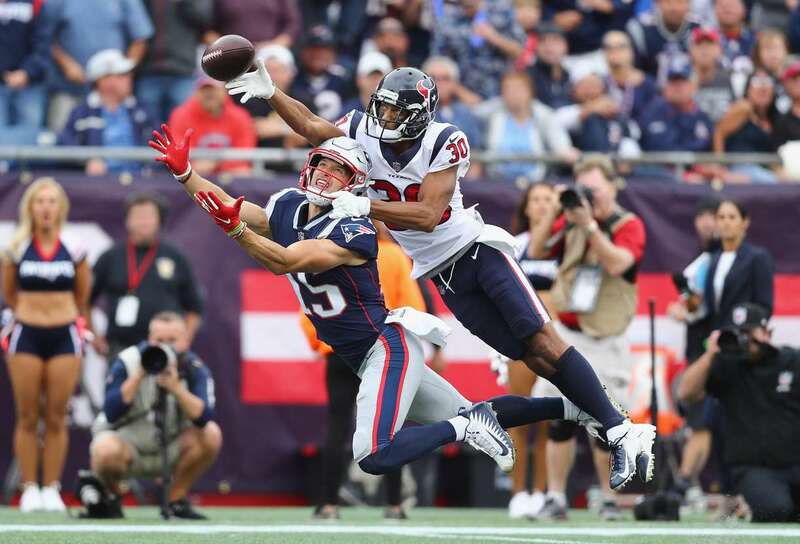 Pic of the Week: Houston Texans cornerback Kevin Johnson deflects a pass intended for New England Patriots receiver Chris Hogan on Sunday. The Patriots won 27-20.